U.S. Sen. Ted Cruz belongs to an elite club of lawyers who have repeatedly argued before the U.S. Supreme Court. A closer look at the nine times the Texan argued before the justices shows wins and losses as he challenged legal limits. Before he was a U.S. senator or a candidate for president, Ted Cruz argued before the U.S. Supreme Court nine times, putting the Texas Republican in an exclusive club. “Most lawyers in America will never argue in front of the Supreme Court, much less do it nine times,” said Paul Collins, director of legal studies at the University of Massachusetts Amherst. For all but one of his nine cases before the nation’s highest court, Cruz represented the state of Texas as its solicitor general. It was a role that allowed him to challenge the legal limits of hot-button issues such as the Voting Rights Act and states’ rights. 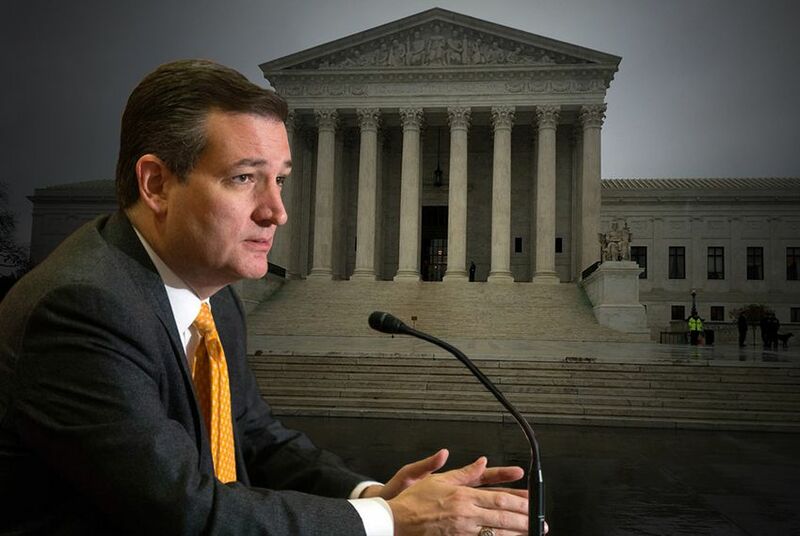 Over nine trips to the Supreme Court, Cruz clearly lost four cases and won two. The other three rulings were less clear-cut. Click here to scroll down and take a closer look at each case and hear audio clips from the arguments. Five cases involved the death penalty. One dealt with Texas’ intense efforts to keep a calculator thief behind bars. Another was essentially a patent fight over a deep fat fryer. Cruz’s most well-known case, involving convicted murderer José Medellín, reached the Supreme Court twice. Cruz ultimately won, allowing the state to execute Medellín despite an order from an international court and the urging of President George W. Bush to hold off so Medellín could receive a new hearing. Just as he did during his successful U.S. Senate campaign in 2012, Cruz is citing the case on the presidential campaign trail to frame himself as a seasoned fighter for conservative causes. Cruz also brought up his experience at the Supreme Court during this month's Republican presidential debate, in which opponent Donald Trump warned that Canadian-born Cruz may not be eligible to be president. “I mean, you have great constitutional lawyers that say you can’t run,” Trump said. The audience cheered Cruz's response. "I've spent my entire life defending the Constitution before the U.S. Supreme Court," Cruz said. "And I'll tell you, I'm not going to be taking legal advice from Donald Trump." As Cruz told The Texas Tribune in an interview in 2012, he was working at the Federal Trade Commission in 2002 when he received a call “out of the blue” to interview for the solicitor general position. Cruz had gained a reputation as a strong appellate lawyer before joining the Bush campaign. He had also clerked for Chief Justice William Rehnquist after graduating from Harvard Law School. Cruz recalled that Greg Abbott, the new attorney general, originally asked him to commit to stay on for two and a half years. “Ultimately I ended up staying five and a half years because the opportunity to fight for conservative principles and lead some of the biggest battles in the country defending the Constitution was just extraordinary,” Cruz said. Below is a closer look at the nine cases Cruz argued before the U.S. Supreme Court. Audio excerpts of the arguments were downloaded from Oyez, a free law project at the IIT Chicago-Kent College of Law.